Staying on top of the latest trends, and investing in Research & Development is something that the Sencia team focuses on every day. Mobile trends and accessibility remain a top area of focus today. The proverbial phrase, “when life gives you lemons, make lemonade” is exactly what Thunder Bay locals, Irene Kozlowski and Joe Quaresima did back in the 2001 when the company they worked for suddenly closed. Now 12 years later, the partners head up one of North America’s most innovative web-based businesses, Sencia Canada Ltd.
SIMS, best known in Thunder Bay, provides businesses with the ability to update their websites with powerful, easy-to-use tools using latest technologies but the company’s highest revenue product is the Informetica System; a learning content management system enabling clients to train students, staff or customers online. With Informetica, users can access course or topic libraries, transcripts and certifications significant to their job roles or program of study. The system provides powerful reports to managers and instructors. 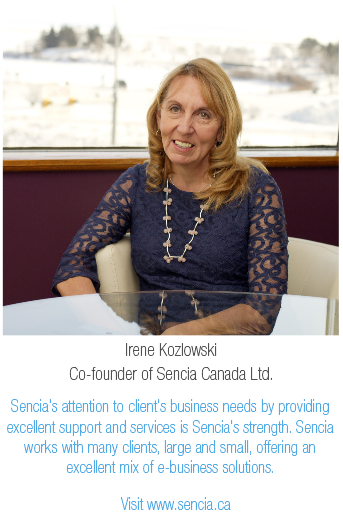 Specializing in online application development, Sencia Canada boasts 18 employees and over 400 clients worldwide. Ninety-six percent of annual revenues are recurring, which offers stability to Sencia’s employees and clients. Sencia is thriving in the competitive information technology industry and is proud to be in Thunder Bay. Kozlowski attributes these significant triumphs to the entire team. “People who work here are passionate about what they do. We hire professionals who will listen and learn about our client’s needs and then transform or configure our systems to help them achieve their goals. We totally understand that if our clients do well, we do well. In recent years, technology has evolved dramatically and clients are looking for companies that can provide solutions specific to their needs. In terms of advice for budding online entrepreneurs, Kozlowski is humble and recommends asking for help. “We as people are always so hard on ourselves, especially as new entrepreneurs. We need to listen to clients and partner with complementary businesses to provide expertise from all angles. It is pivotal in today’s market.” The Sencia story is proof positive that a sour situation can really become something sweet!